Currently, for websites that have some pages you want to create their own promotion or restrict some customer groups to visit these pages. 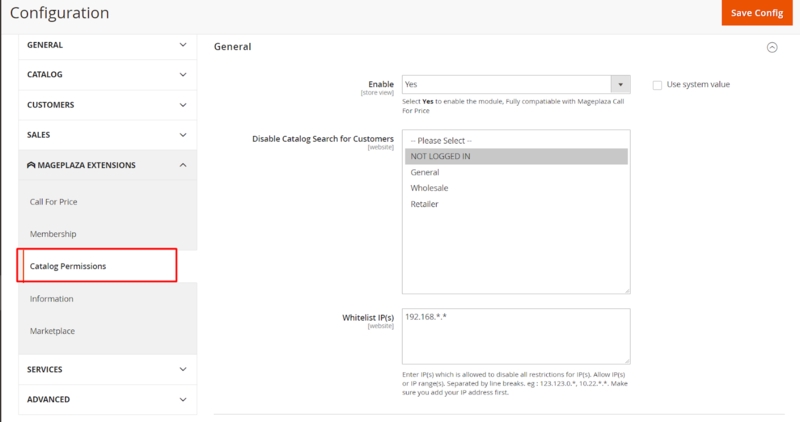 With the Mageplaza Catalog Permissions extension, admin can restrict access to catalogs with Category, Product Detail, and Static Page/Block pages by customer groups and IP addresses. In particular, you can redirect customers to another page when accessing restricted pages or hiding restricted pages at the frontend. Enable: Select Yes to enable the module. You can install Call for Price extension of Mageplaza to contact the store to ask for price or product information or ask for the restricted page you want to access. For other IP addresses not included in this field, it will be restricted to choosen pages. If left blank, it is restricted to all IP addresses when accessing the restricted site. 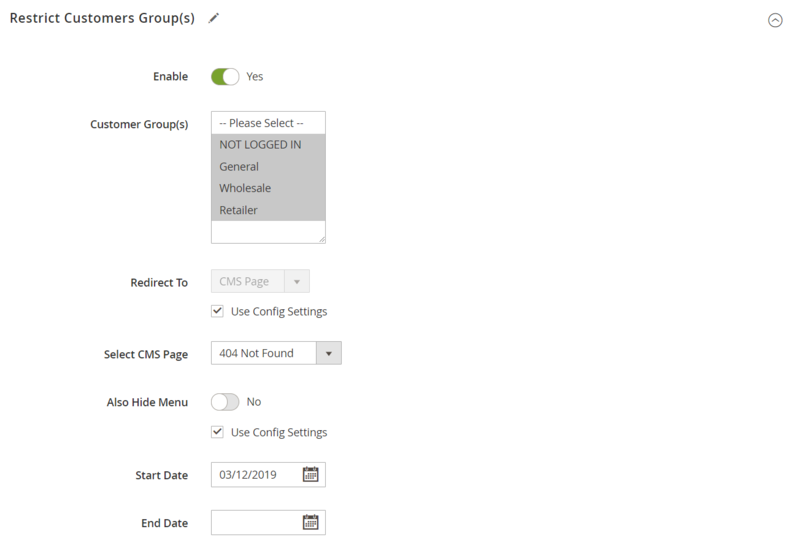 Enable: Select Yes to enable Restrict Category and will display a new field Customer Group Restriction under the Content tab when accessing the Catalog> Categories. CMS Page: Display the Select CMS Page field to select CMS Page to be redirected to when access to the restricted category. Select CMS Page: Select CMS page. You can access Content > Page, click Add New Page to create more pages you want to redirect to. If Yes is selected, it will hide the Category outside the Frontend. Enable: Select Yes to enable Restrict Product and will display a new field Customer Group Restriction under the Content tab when accessing the Catalog> Products. CMS Page: Display the Select CMS Page field to select CMS Page to be redirected to when access to the restricted Product. If Yes is selected, it will hide the product on the category page and widget. 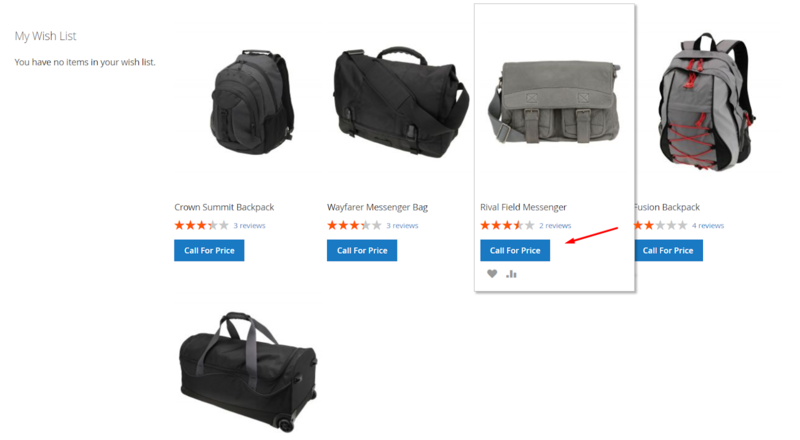 If No is selected, it will not hide Product on category page and widget and will display product as usual. Enable: Select Yes to enable Restrict Static Page and will display a new field Customer Group Restriction under the Content tab when accessing the Catalog> Page. Enable: select Yes to enable Restrict Static Block and will display a new field Customer Group Restriction when accessing Content > Blocks. This section applies the configuration when choose new/edit for each Category. Note: If the Restrict Category in the Configuration section and for each Category here are different, priorities will be given to each category first. Default is No if Enable Restrict Category is enabled. If Yes is selected, it will enable Restrict Category with the category you choose. Show more fields: Restriction Customers Group(s), Redirect To fields, Also Hide Menu, Start Date, End Date. Selecting No will turn off Restrict Category with the category you do not want to restrict it to customers. You can choose Use Config Settings to redirect to the default URL or CMS page that you set in Configuration Restrict Category, at Redirect To field. Select Yes to hide that category in Frontend. Otherwise, selecting No will display that category in Frontend. You can select Use Config Settings to default to use the configured value at Configuration Restrict Category with Hide menu on Frontend field. Click the Calendar box to select the start date for Restrict Category. - If you leave it blank, then applying Restrict Category will start from the date you anable until End Date. Click the Calendar box to select the end date for Restrict Category. If left blank in this field, it will start applying Restrict Category by the date selected in the Status Date field and will not end up applying Restrict Category until it is disabled for that category. 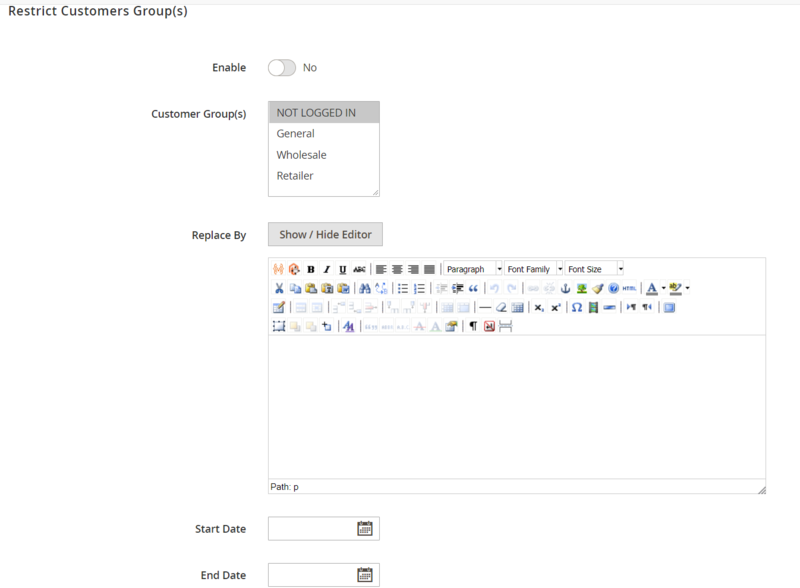 This section applies the configuration when choose new/edit for each Product. Note: If the Restrict Products in the Configuration section and for each Product here are different, priorities will be given to each Product first. Default is No if Enable Restrict Product is enabled. If Yes is selected, it will enable Restrict Product with the Product you choose. Show more fields: Restriction Customers Group(s), Redirect To fields, Also Hide Menu, Start Date, End Date. Selecting No will turn off Restrict Product with the Product you do not want to restrict it to customers. 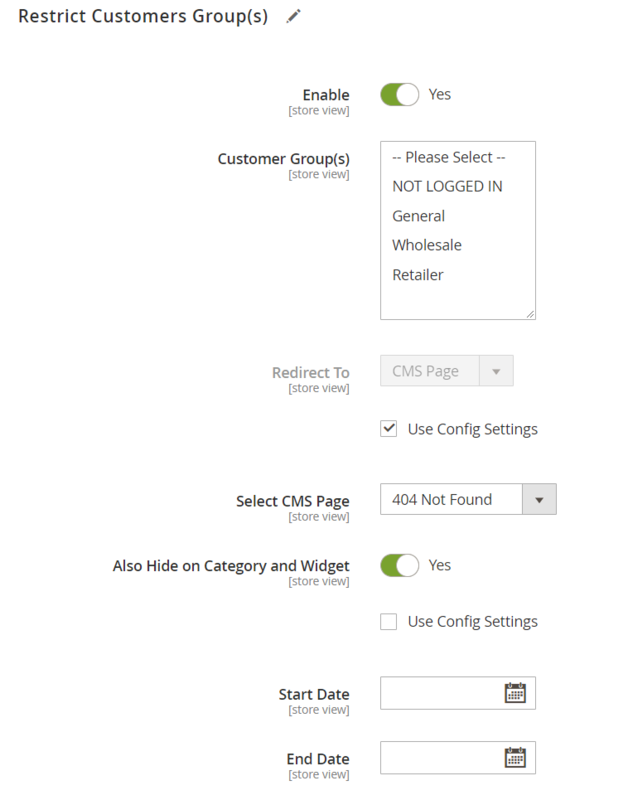 You can choose Use Config Settings to redirect to the default URL or CMS page that you set in Configuration Restrict Product, at Redirect To field. Select Yes to hide that Product in Frontend. 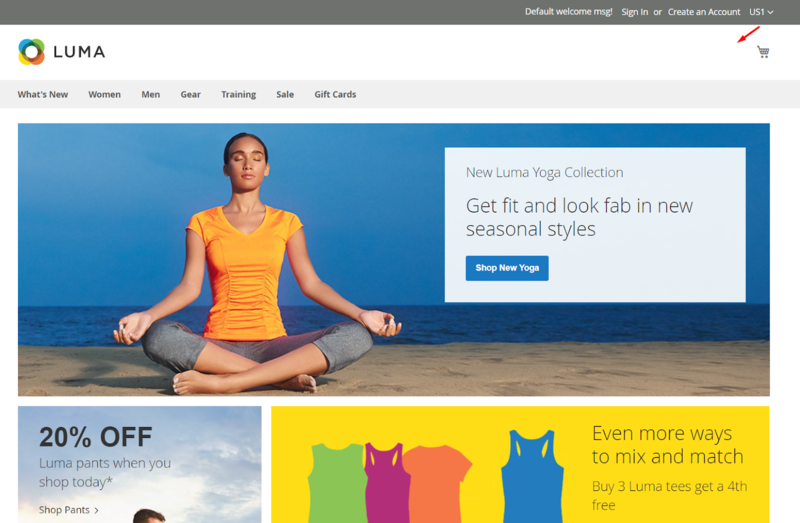 Otherwise, selecting No will display that Product in Frontend. You can select Use Config Settings to default to use the configured value at Configuration Restrict Product with Hide menu on Frontend field. Click the Calendar box to select the start date for Restrict Product. - If you leave it blank, then applying Restrict Product will start from the date you anable until End Date. Click the Calendar box to select the end date for Restrict Product. If left blank in this field, it will start applying Restrict Product by the date selected in the Status Date field and will not end up applying Restrict Product until it is disabled for that Product. Login to the Magento Admin, choose Catalog> Pages/Blocks, select new/edit with a Restrict Static Page/Restrict Static Block you want. This section applies the configuration when choose new/edit for each Page/Block. Note: If the Restrict Static Page/Restrict Static Block in the Configuration section and for each Page/Block here are different, priorities will be given to each Page/Block first. Replace By: Will be replaced by the Show/Hide Editor button. Here, it is possible to configure the block page and when accessing the restricted Block page will be replaced by the block page you have configured. If left blank, Replace By will default to the Replace By content above. If you delete the extension manually, you need to delete mpcp_isactive, mpcp_customergroup, mpcp_redirectto, mpcp_usecf_redirectto, mpcp_hideaction, mpcp_usecf_hideaction, mpcp_startdate, mpcp_enddate attribute in the database. Access the database to delete: Access to eav_attribute table. In the attribute_code column, find and delete the mpcp_isactive, mpcp_customergroup, mpcp_redirectto attribute, mpcp_usecf_redirectto, mpcp_hideaction, mpcp_usecf_hideaction, mpcp_startdate, mpcp_enddate.